Say goodbye to stress on the road with this spoken word CD by Laughing Laura Gentry. 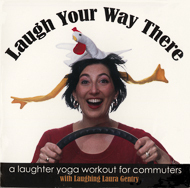 Laugh your way to health and happiness as you drive or ride your daily commute. Using the principles of Laughter Yoga, a worldwide movement initiated by Dr. Madan Kataria of India, you'll laugh, cheer, do deep breathing, positive affirmations, happy chants, and more, thereby transforming your commute into an exercise for mind, body, and spirit. Each exercise of this 23-minute workout is introduced by Laughing Laura and demonstrated by a group of zealous laughers making it easy to join in. Laugh Your Way There — the only product of its kind delivers big fun!